Abeles & Heymann Hot Dogs in Israel. Abeles & Heymann, the venerable maker of award-winning premium Glatt kosher hot dogs, is making Aliyah, and will be an official sponsor of the US Embassy’s 242nd Independence Day Celebration being held in Israel. The event, hosted by U.S. Ambassador to Israel David M. Friedman, will take place on July 3rd, with some 2,800 distinguished guests including government officials, community partners, and business leaders, who are invited to enjoy kosher A&H Hot Dogs on buns along with A&H mustard served from the dedicated A&H booth at the event. The event coincides with the debut of A&H Kosher Hot dogs in the Israeli market, which has long been craving these famous hot dogs, particularly American Olim. Other sponsors of the event include Coca-Cola, Jack Daniel’s, Boeing, Estee Lauder, Blue Moon, American Airlines, Sheraton, The Ritz –Carlton, Pfizer, Lockheed Martin, United Airlines, Colgate and Oracle. Seth Leavitt, CEO of Abeles & Heymann as well as Micha Rakaby, CEO of Yechiam, A&H’s Israeli sister company, will be in attendance. JewishPress.com will also be there to cover the celebrations. 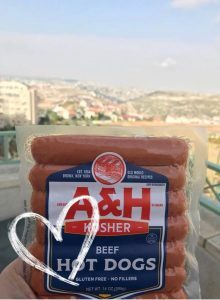 “A&H is honored to be the official sponsor of kosher hot dogs to the US Embassy’s 242nd Independence Day Celebration held in Israel,” Seth Leavitt, CEO of Abeles & Heymann told JewishPress.com. 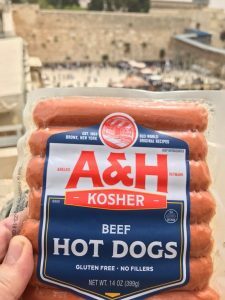 “As we begin our launch of A&H Hot Dogs in Israel, we are excited to meet the needs of those who have made Aliyah as well as those who are in Israel and appreciate quality kosher beef hot dogs,” Seth said. A&H hot dogs are consistently voted as the “Top Dog” in America because they are produced in small batches, use only premium quality ingredients and are slow cooked to perfection. The complete line of products has been made using old world recipes to ensure the superb taste and quality the company has been known for since 1954. The products always are packaged with purity of ingredients that meet the highest standards. Abeles & Heymann premium deli products can be found at Costco and BJ’s, national chain supermarkets such as Stop & Shop, Shoprite, Kroger, Ralph’s, and Acme, as well as independent kosher stores coast to coast. In 1954, Oscar Abeles & Leopold Heymann opened a butcher store in the Bronx, NY known as Abeles & Heymann. In 1997 Seth Leavitt and his attorney cousin David Flamholz bought out Mr. Heymann and his wife Sophie. Heymann, the only surviving partner, stayed on for over a year to teach the two young guys how to make a hot dog among other things, in the Bronx facility. Since then the family-run company has moved to a state-of-the-art facility in New Jersey, and has seen an over tenfold increase in sales. To grow the business even further, in 2012 Abeles & Heymann partnered with the manufacturing arm of an Israeli Kibbutz, (Maadany Yehiam, makers of the Hod Golan line of turkey products) and presently produces over 1,000 tons of quality glatt kosher deli a year. In addition to its no nitrate added, reduced-fat and lower-sodium hot dogs, the company produces all-beef hot dogs, beef fry, kishka, cervelat, knockwurst, and cocktail franks, as well as salami, chipotle franks, corned beef and pastrami. You can find Abeles & Heymann on Instagram.